From fiscal year (FY) 2007 through FY 2017, 34 percent of all aid provided by the Export-Import (Ex-Im) Bank went to just one exporter: Boeing. This makes Boeing the single largest beneficiary of Ex-Im Bank support. For comparison, all small business authorizations combined in this 10-year period totaled only 22 percent of Ex-Im Bank aid. While the Ex-Im Bank had a quorum, from FY 2007 through FY 2014, small businesses received only 20 percent of support provided by the Ex-Im Bank. Minority-owned businesses and female-owned businesses fared even worse, at 2 percent and 1 percent, respectively. 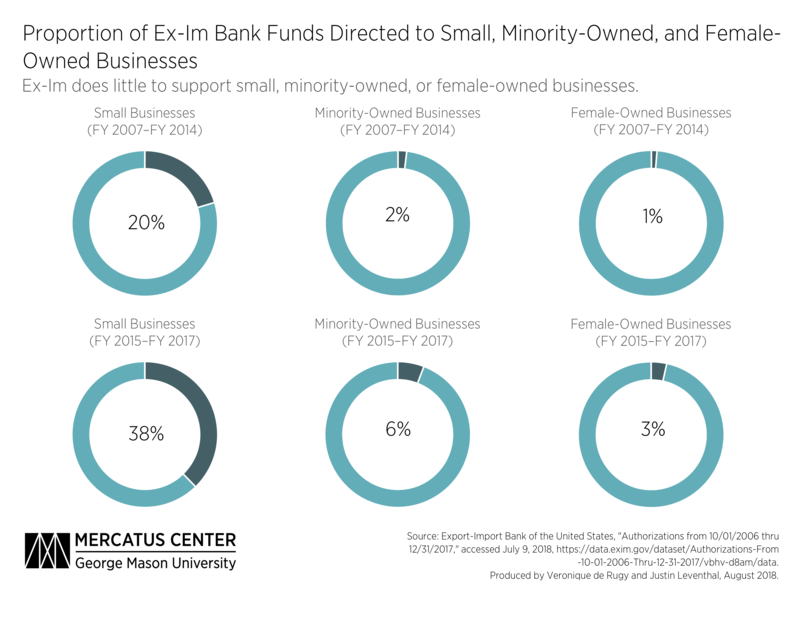 While small business allocations have shown significant increases since the Ex-Im Bank’s quorum lapsed, allocations to minority-owned and female-owned businesses have seen far more modest improvements. From FY 2015 through FY 2017, the portion of support directed to small businesses increased to 38 percent of all Ex-Im Bank support, the portion directed to minority-owned businesses increased to 6 percent, and female-owned businesses’ share grew to 3 percent. Much like the rest of the Ex-Im Bank’s recent history, Boeing’s story can be divided into two parts around the year the Ex-Im Bank lost its quorum. From FY 2007 through FY 2014, while the Ex-Im Bank had a quorum, companies purchasing products from Boeing received 70 percent of all loan guarantees and 35 percent of all aid provided by the Ex-Im Bank. Boeing’s customers received more financial support during this time than all foreign customers of American small businesses combined. In the time that the Ex-Im Bank has lacked a quorum, Boeing has received a smaller proportion of the Ex-Im Bank’s support. 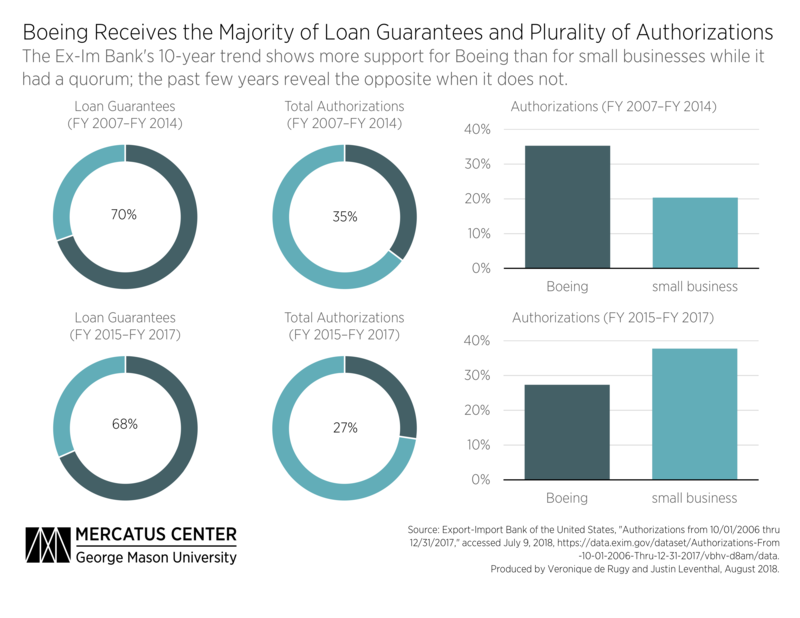 From FY 2015 through FY 2017 the proportion of loan guarantees that supported Boeing’s sales only dropped slightly, and the proportion of all authorizations benefiting Boeing fell from just over one-third to just over one-quarter.